Hydraulic fracturing has driven down the price of natural gas from a high of $13 per million British Thermal Units (mmBTU) in 2008, natural gas prices have plummeted to below $2.00 per mm BTU, nearing record-setting lows, a game changer for both coal and renewables. The impact of 10,000's or even 100,000's of fracked natural gas wells near where people live has not been fully vetted. Is cheap natural gas worth the risk? 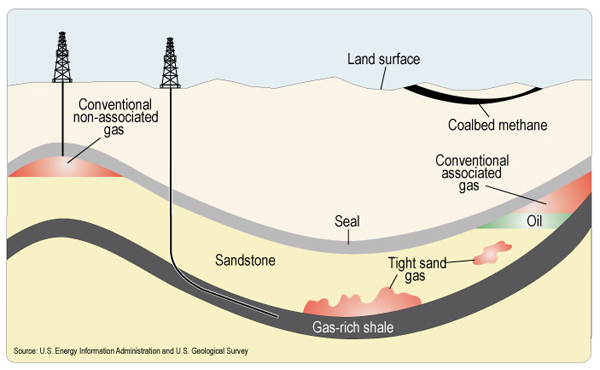 The geology of shale natural gas formations differs from formation to another. Best practices fracking technology from one region may not be safe in another part of the country. Natural gas is a cornerstone of the U.S. economy, providing a quarter of the country’s total energy. Owing to breakthroughs in technology, production from shale formations has gone from a negligible amount just a few years ago to being almost 30 percent of total U.S. natural gas production. This has brought lower prices, domestic jobs, and the prospect of enhanced national security due to the potential of substantial production growth. But the growth has also brought questions about whether both current and future production can be done in an environmentally sound fashion that meets the needs of public trust. Fracking refers to the procedure of creating fractures in rocks and rock formations by injecting fluid into cracks to force them further open. The larger fissures allow more oil and gas to flow out of the formation and into the wellbore, from where it can be extracted. A well is drilled vertically to the desired depth, then turns ninety degrees and continues horizontally for several thousand feet into the shale believed to contain the trapped natural gas. A mix of water, sand, and various chemicals is pumped into the well at high pressure in order to create fissures in the shale through which the gas can escape. The liquid goes through perforated sections of the wellbore and into the surrounding formation, fracturing the rock and injecting sand or proppants into the cracks to hold them open. Natural gas escapes through the fissures and is drawn back up the well to the surface, where it is processed, refined, and shipped to market. This process may be repeated multiple times in “stages” to reach maximum areas of the wellbore. When this is done, the wellbore is temporarily plugged between each stage to maintain the highest water pressure possible and get maximum fracturing results in the rock. The fracturing plugs are drilled or removed from the wellbore and the well is tested for results. Wastewater (also called "flowback water" or "produced water") returns to the surface after the fracking process is completed for disposal or treatment and re-use, leaving the sand in place to prop open the cracks and allow gas and oil to flow. In Michigan, this water is contained in steel tanks until it can be stored long-term by deep injection in oil and gas waste wells. 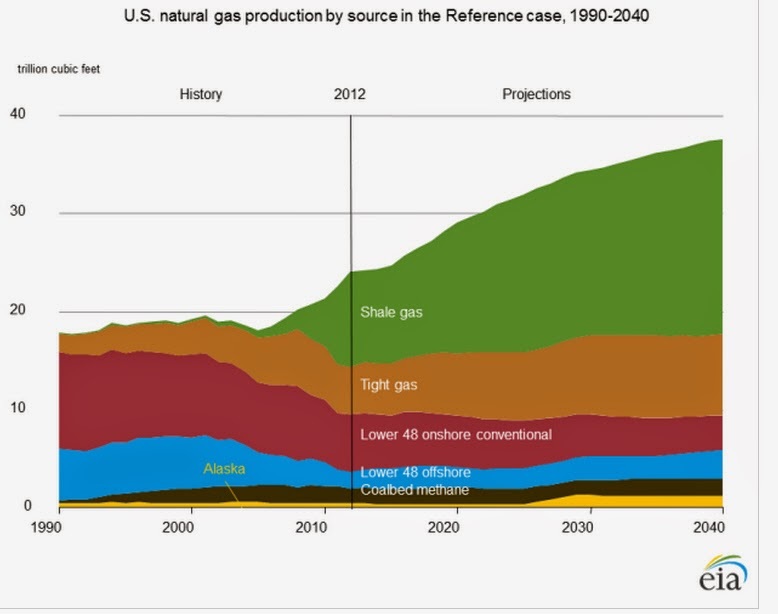 The development of shale gas in the United States has been very rapid. Natural gas from all sources is one of America’s major fuels, providing about 25 percent of total U.S. energy. Shale gas increased from ess than two percent of total U.S. natural gas production in 2001. to almost 40% by 2014. The USEIA expects the share to reach 50% by 2025. This very rapid growth has contributed to a situation where there is not consensus on the environment impacts impact of fracking, nor is the science completely understood. In addition, state and federal regulatory frameworks have not kept pace with the rapid expansion of production rooted in change in applications of technology and field practice. Parts of the country, such as regions of the Appalachian mountain states where the Marcellus Shale is located, which have not experienced significant oil and gas development for decades, are now undergoing significant development pressure. Pennsylvania, for example, which produced only one percent of total dry gas production in 2009, is one of the most active new areas of development. Even states with a history of oil and gas development, such as Wyoming and Colorado, have experienced significant development pressures in new areas of the state where unconventional gas is now technically and economically accessible due to changes in drilling and development technologies. Output from the Haynesville shale, mostly in Louisiana was negligible in 2008; today, the Haynesville shale alone produces eight percent of total U.S. natural gas output. gas production is expected to continue in the future. 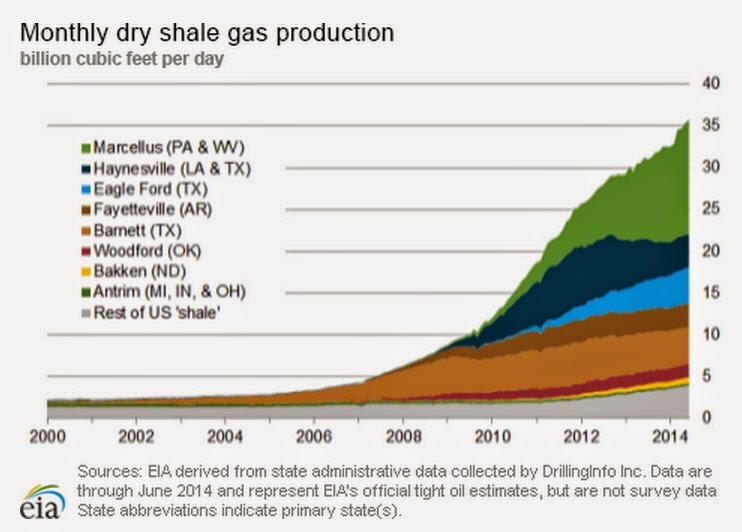 The EIA projects shale gas to be 45 percent of domestic production by 2035. What will be the environmental impact? The 56% increase in total natural gas production from 2012 to 2040 in the AEO2014 Reference Case results from increased development of shale gas, tight gas and offshore natural gas resources. Bakken Formation - - Rock unit from the Late Devonian to Early Mississippian age occupying about 200,000 square miles of the subsurface of the Williston Basin, underlying parts of Montana, North Dakota, and Saskatchewan. The formation is entirely in the subsurface, and has no surface outcrop. It is named after Henry Bakken, a farmer in Williston, ND who owned the land where the formation was initially discovered. in 1953. Completion - The process of making a well ready for production (or injection). This principally involves preparing the bottom of the hole to the required specifications, running in the production tubing and its associated down hole tools as well as perforating and stimulating as required. Sometimes, the process of running in and cementing the casing is also included. Closed Loop System - Consists of using a small waste-water processing system on the well site. It removes pollutants from the frack water as well as additional water that may also be present in the formation itself--all of which flows back up a well. Waste water is pumped directly into steel storage containers and held for processing. Solids extracted from the water by this method are removed by truck to a waste treatment station for disposal. Treated water that remains after on-site processing may then be reused on a later frack job. Typically, up to 50 percent of the frac water can be recovered and reused. It can be reused up to a dozen times without treatment. Less waste water needs to be moved off site, and less water is required for additional drilling operations. This method generally lowers total drilling cost, as well as the amount of water used and its cost. It also contributes to higher drill rates which provides cost savings. Dissolved Hydrocarbons - Found in both flowback and produced water. Some are pumped down the well during hydro-fracturing. These consist of glycols used in descaling and some light petroleum distillates used to enhance viscosity of the fracturing fluid. These are generally around 0.1% of the fracturing fluid volume. Flowback water typically contains both free and dissolved hydrocarbons that come from the formations. These are dissolved in the frac water when it is pumped underground and held there under pressure during hydro-fracturing. Many of these are lighter than water and return to the surface with the flowback. Concentrations in the flowback water are usually low--below 100 parts per million. These can generally be removed by absorption using activated carbon during treatment. There are federal and state regulations preventing release of dissolved and free hydrocarbons into water steams, so they must be removed. GWP - Global Warming Potential - Commonly used to compare the radiative forcing of ifferent gases relative to CO2 and represents the ratio of the cumulative radiative forcing t years after emission of a GHG to the cumulative radiative forcing from emission of an equivalent quantity of CO2. Comparing the climate implications of CH4 and CO2 emissions is complicated because of the much shorter atmospheric lifetime of CH4 relative to CO2. On a molar basis, CH4 produces 37 times more radiative forcing than CO2. However, because CH4is oxidized to CO2 with an effective lifetime of 12 yr, the integrated, or cumulative, radiative forcings from equi-molar releases of CO2 and CH4 eventually converge toward the same value. Determining whether a unit emission of CH4is worse for the climate than a unit of CO2 depends on the time frame considered. Because accelerated rates of warming mean ecosystems and humans have less time to adapt, increased CH4emissions due to substitution of natural gas for coal and oil may produce undesirable climate outcomes in the near-term. The Intergovernmental Panel on Climate Change (IPCC) typically uses 100 yr for the calculation of GWP. Howarth et al. (1) emphasized the 20-year GWP, which accentuates the large forcing in early years from CH4 emissions, whereas Venkatesh et al. adopted a 100-yr GWP and Burnham et al. (4) utilized both 20-and 100-yr GWPs. GWPs were established to allow for comparisons among GHGs at one point in time after emission but only add confusion when evaluating environmental benefits or policy trade-offs over time. Policy tradeoffs like the ones examined here often involve two or more GHGs with distinct atmospheric lifetimes. A second limitation of GWP-based comparisons is that they only consider the radiative forcing of single emission pulses, which do not capture the climatic consequences of real-world investment and policy decisions that are better simulated as emission streams. Flowback Water - aka backflow water - The murky, salty water from fracking natural gas wells. It consists of frac fluid which returns to the surface (aka the frac load recovery) as well as produced water. This water contains clay, dirt, metals, chemicals and even diesel that may have been added. The frack load recovery can be anywhere from 15-40% percent of the volume of fluid that is injected, that is forced down a well, and it flows back over a period of 3-4 weeks after fracking--most of it within 7 to 10 days. More than half of the frack fluid remains in the formation. At a certain point there is a transition between primarily recovering frack fluid to that of produced water. 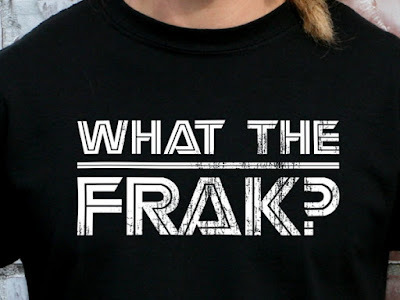 Usually this point is difficult to distinguish, yet may be discerned from the different chemical signatures of the frack water versus the naturally occurring water produced by the formation. A typical flowback of frack fluids might run 40,000 bbl. After the initial 3-4 week post-fracking recovery of fluids, an additional 10,000 to 30,000 bbl of produced water may flow for up to two years. Flowback water may be characterized as having high salinity and total dissolved solids (TDS). It is laden with the same fracking chemicals that were pumped into the well, in addition to any unique contaminants that are present in the rock formation water deep below. In addition to natural salinity of water in the formation, any fresh water that is forced down a well, when it is fracked, will tend to dissolve salts in the formation thus giving the recovered water very high salinity. The retuning fluid is generally collected in metal tanks or else open pools, lagoons or pits lined with one or more layers of plastic. These are then pumped dry, and water is usually either recycled for fracking additional wells or else trucked off site to a waste water disposal facility. Containment pits, or open-air ponds that are lined with plastic, can become points of failure. Occasionally, liners get cracked or damaged. Contaminated fluids can then leach into ground water. Increasingly, drillers are shifting to closed loop systems as the preferred method of handling flowback water. Fracking Additives - While companies performing fracking have resisted disclosure of the exact contents of the fracking fluid by claiming that this information is proprietary, studies of fracking waste indicate that the fluid contains: formaldehyde, acetic acids, citric acids, and boric acids, among hundreds of other chemical contaminants. Between 24,000 pounds and 230,000 pounds of chemicals into each well. Some of the chemicals are relatively harmless, used in common household products. But others – such as 2-butoxyethanol – are known to cause cancer in animals. Acid Helps dissolve minerals and initiate cracks in the rock Reacts with minerals present in the formation to create salts, water and carbon dioxide (neutralized). 1. Open and extend the fracture. 2. Transport the proppant along the fracture length. Fracture gradient - The pressure to fracture the formation at a particular depth divided by the depth. A fracture gradient of 18 kPa/m (0.8 psi/foot) implies that at a depth of 3 km (10,000 feet) a pressure of 54 MPa (8,000 psi) will extend a hydraulic fracture. Fracture Monitoring - Injection of radioactive tracers along with the other substances in hydraulic fracturing fluid is used to determine the injection profile and location of fractures created by hydraulic fracturing, Gamma-emitting tracer isotopes that can be used as radioactive tracer material, include Antimony-121, Antimony-122, Antimony-123, Antimony-124,Antimony-125, Antimony-126, Antimony-127, Chromium-51, Cobalt-57, Cobalt-58, Cobalt-60, Gold-198, Iodine-127, Iodine-128, Iodine-129, Iodine-130, Iodine-131, Iridium-192, Iron-59, Krypton-85, Potassium-39 (activated to Potassium-40), Potassium-41 (activated to Potassium-42), Potassium-43, Rubidium-86,Scandium-45 (activated to Scandium-46), Scandium-47, Scandium-48, Silver-110, Strontium-85, Xenon-133, Zinc-65, and Zirconium-95. ;Iodine-131 was listed more often than other isotopes. In April 2011, the EPA found elevated iodine-131 levels in Philadelphia's drinking water and milk from Little Rock, Arkansas. The National Cancer Institute has reported that children exposed to iodine-131, especially those drinking a great deal of milk, may have an increased risk of thyroid cancer. Both Philadelphia and Little Rock are located downstream from shale formations in which hydraulic fracturing is occurring. Iodine-131 was also found in the drinking water of other cities near other hydrofracturing sites. There are other sources for Iodine-131 such as nuclear energy production and the March 2011 Japanese nuclear incident. ISIP — Initial shut in pressure - Pressure measured immediately after injection stops. The ISIP provides a measure of the pressure in the fracture at the wellbore by removing contributions from fluid friction. Marcellus Formation - A unit of marine sedimentary rock found in eastern North America. Named for a distinctive outcrop near the village of Marcellus, New York, it extends throughout much of the Appalachian Basin. 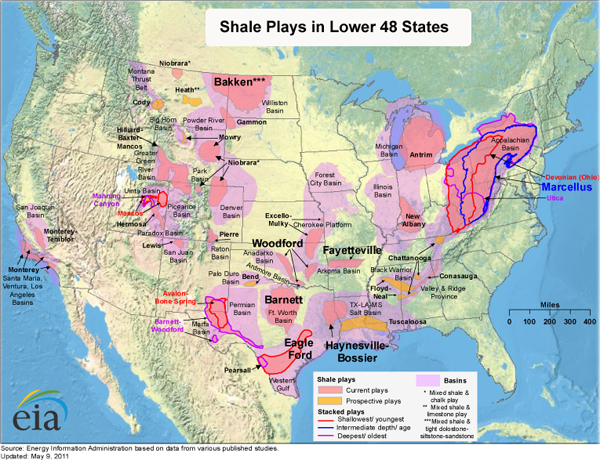 The shale contains largely untapped natural gas reserves, and its proximity to the high-demand markets along the East Coast of the United States makes it an attractive target forenergy development. NGL - Natural Gas Liquids - Hydrocarbons such as propane, ethane, butane, and pentanes that are mingled with methane in wet gas areas such as ;the Marcellus shale such as southwestern Pennsylvania and northern West Virginia. These must be separated from the methane before it can be transported by gas pipelines. Wet gas, or condensate, develops in lower pressure areas of the Marcellus play. "Dry gas" occurs in higher pressure areas that tend to be more mountainous. NGLs can be separated from methane in a cryogenic processing plant. NORM - Naturally Occurring Radioactive Material - Radon gas in the natural gas streams concentrate as NORM in gas processing activities. Radon decays to Lead 210, then to Bismuth 210, Polonium 210 and stabilizes with Lead 206. Radon decay elements occur as a shiny film on the inner surface of inlet lines, treating units, pumps and valves associated with propylene, ethane and propane processing systems. NORM characteristics vary depending on the nature of the waste. NORM may be created in a crystalline form, which is brittle and thin, and can cause flaking to occur in turbulars. NORM formed in carbonate matrix can have a density of 3.5 grams/cubic centimeters and must be noted when packing for transportation. NORM scales may be white or a brown solid, or thick sludge to solid, dry flaky substances.Cutting and reaming oilfield pipe, removing solids from tanks and pits, and refurbishing gas processing equipment may expose employees to particles containing increased levels of alpha emitting radionuclides that could pose health risks if inhaled or ingested. NORM is not federally regulated in the United States. The Nuclear Regulatory Commission (NRC) has jurisdiction over a relatively narrow spectrum of radiation, and the Environmental Protection Agency (EPA) has jurisdiction over NORM and has never developed NORM regulations. Therefore, this responsibility befalls the states. Since no government entity has implemented regulations, then states may choose the stringency or lax of the regulations. Produced Water - Produced water is naturally occurring water found in the sedimentary shale beds traversed by the wellbore. It is generally very saline in nature and presents an environmental challenge for drillers. Produced water requires proper treatment before disposal. It should not be confused with recovered fracturing fluid pumped down a well when it is hydro-fractured. There is a point where the water that flows up a well shifts from being primarily recovered fracturing fluid to that of produced water. The dividing line can be difficult to discern, yet can be distinguished by comparing the different chemical signatures of the recovered frack fluid to that of the naturally-occurring shale formation water. Produced water has very high salinity and total dissolved solids (TDS).It picks up various minerals from the shale formation including barium, calcium, iron, magnesium and sulpher. There are also dissolved hydrocarbons present in produced water. Produced water may also include low levels of naturally occurring radioactive substances (NORM) such as radium. Proppant - Suspended particles in the fracturing fluid that are used to hold fractures open after a hydraulic fracturing treatment, thus producing a conductive pathway that fluids can easily flow along. Naturally occurring sand grains or artificial ceramic material are common proppants used. SB 4 - California Law regulating fracking - After intense debate and heavy lobbying from all sides, the state Senate and Assembly approved a fracking bill on Sep 11, 2013 that gained momentum from Gov. Jerry Brown’s public endorsement. The bill is particularly timely because of the potential for a drilling boom in California’s Monterey Shale. SB4 will erect a permitting system for fracking, and regulates acidizing. The measure also mandates groundwater monitoring and requires fracking firms to notify neighbors of planned wells. Companies also would have to release more information about the chemicals they shoot underground. It has been opposed by both industry and environmental groups. Requires the Secretary of the Natural Resources Agency, on or before January 1, 2015, to cause to be conducted, and completed, an independent scientific study on well stimulation treatments, including acid well stimulation and hydraulic fracturing treatments. Requires an owner or operator of a well to record and include all data on acid treatments and well stimulation treatments, as specified. Requires the division, in consultation with the Department of Toxic Substances Control, the State Air Resources Board, the State Water Resources Control Board, the Department of Resources Recycling and Recovery, and any local air districts and regional water quality control boards in areas where well stimulation treatments may occur, on or before January 1, 2015, to adopt rules and regulations specific to well stimulation, including governing the construction of wells and well casings and full disclosure of the composition and disposition of well stimulation fluids, and would authorize the division to allow well stimulation treatments if specific conditions are met. Requires an operator to apply for a permit, as specified, with the supervisor or district deputy, prior to performing a well stimulation treatment of a well and prohibits the operator from either conducting a new well stimulation treatment or repeating a well stimulation treatment without a valid, approved permit. Require the division, within 5 business days of issuing a permit to commence a well stimulation treatment, to provide a copy to specific boards and entities and to post the permit on a publicly accessible portion of its Internet Web site. Provides that the well stimulation treatment permit expires one year from the date that a permit is issued. Requires the division to perform random periodic spot check inspections during well stimulation treatments, as specified. Requires the Secretary of the Natural Resources Agency to notify various legislative committees on the progress of the independent scientific study on well stimulation and related activities, as specified, until the study is completed and peer reviewed by independent scientific experts. Requires the operator to provide a copy of the approved well stimulation treatment permit to specified tenants and property owners at least 30 days prior to commencing a well stimulation treatment. Requires the operator to provide notice to the division at least 72 hours prior to the actual start of a well stimulation treatment in order for the division to witness the treatment. Requires the operator, within 60 days of the cessation of a well stimulation treatment, to post or cause to have posted on an Internet Web site accessible to the public specified information on the well stimulation fluid, as specified. Requires the division to commence a process to develop an Internet Web site for operators to report specific information related to well stimulation treatments and would require the Internet Web site to be operational no later than January 1, 2016. Requires a supplier claiming trade secret protection for the chemical composition of additives used in a well stimulation treatment to disclose the composition to the division, in conjunction with a well stimulation treatment permit application, as specified, but would, with certain exceptions, prohibit those with access to the trade secret from disclosing it. Because this bill creates a new crime, it would impose a state-mandated local program. TDS - Total Dissolved Solids - The gritty substance that is a mixture of salt and other dissolved minerals that come from deep underground in the Marcellus shale. Drilling waste water has enough TDS to make it up to five times as salty as seawater. Large quantites of TDS can produce a salty sediment. If it is used in industrial processes, this polluted water can corrode and clog any machinery that is being employed. When waste water contaminated with TDS is left untreated and finds its way into the drinking water supply, it can affect the color, tastes and odor of the water. Should it come in contact with freshwater streams it can also be very harmful to fish and other creatures who make it their habitat. Waste water containing TDS is typically treated in sewage treatment plants, although it can also be recycled by the drillers before its final disposal. The substance is not considered to be a major health risk. TDS are not unique to natural gas drilling. They are also produced as a by-product of other extraction industries--the most notable in the Appalachian area is coal mining. Tight Gas - Natural gas which is difficult to access because of the nature of the rock and sand surrounding the deposit. The Natural gas reservoirs have low porosity and low permeability. It can be compared to drilling a hole into a concrete driveway–the rock layers that hold the natural gas are very dense, therefore the gas doesn’t flow easily. Because this gas is so much more difficult to extract than natural gas from other sources, companies require a large financial incentive to go after it. Wood Mackenzie defines Tight Gas as gas held in reservoirs with a permeability of below 0.1 milli Darcies including gas held in shales. A medium with a permeability of 1 darcy permits a flow of 1 cm³/s of a fluid with viscosity 1 cP (1 mPa·s) under a pressure gradient of 1 atm/cm acting across an area of 1 cm². A millidarcy (md) is equal to 0.001 darcy and a microdarcy (µd) equals 0.000001 darcy. After sorting through the evidence, my opinion is fracking is a mining operation. Mining is inherently dirty and not an activity I'd want close to my home, but I would't like to life right next to any industrial process. Fracking is not evil and the risks can be mitigated, but accidents and negligence are real dangers and should be regulated. Fracking can be done correctly, without pollution. Frack fluids definitely contain toxic chemicals, but so do about 100,000 other industrial processes. For example, those employed in making paper are much worse and we're not debating whether or not to have a paper industry. The environmental impacts of shale development are challenging but manageable. Research and regulation, both state and Federal, are needed to minimize the environmental consequences. emissions by up to 20%, while also reducing emissions of criteria pollutants and mercury. Furthermore, additional gas-ﬁred capacity will be needed as backup if variable and intermittent renewables, especially wind, are introduced on a large scale. Power Generation - The fracking binge has already altered the outlook for the U.S. power and manufacturing sectors. More than the rise of renewables, cheap natural gas has paved the way for the retirement of more than 100 coal-fired powered plants, too aged to meet federal clean air rules. Efforts to build new coal plants are constrained too. Because natural gas power plants are cheaper to build and fuel, the natural gas boom has radically lowered the count of new coal-fired plants being proposed. According to data tracked by the National Energy Technology Lab and Sierra Club, plans for more than 160 coal plants have been shelved in recent years, partly due to natural gas’ cost advantage, as well as soft growth of demand for power. “Natural gas has done more than other legislative initiative to push coal out of the equation,” said panelist Michael Levi, a senior fellow for energy and the environment at the center for foreign aaffairs, and by my reckoning, one the smartest observers out there on this issue. Manufacturing Jobs - Less than a decade ago, natural-gas-reliant manufacturers were decamping from the U.S., transplanting operations to the Arabian Gulf, Latin America and other gas-rich regions. Now many are returning. Makers of chemicals, fertilizer and pharmaceuticals, all of which use natural gas as both an energy source and a raw material are returning stateside, lured by natural gas for under $2.50 per thousand cubic feet, less than fifth of the price in Europe or East Asia. As Jim Motavalli reports in The New York Times, Nucor, which uses natural gas to make steel, is building a $750-million facility in Louisiana, just eight years after shutting down a similar plant in the same state and shipping it to Trinidad, to tap the island’s recently-developed natural gas supplies. Add up the impact of investments like these and high rates of shale gas recovery could result in a million new manufacturing jobs by 2025, according to a 2011 PricewaterhouseCoopers study cited by Motavalli. Transportation - Compared to current petroleum prices, natural gas costs $1.50 per gallon equivalent, nearly two-thirds less than current pump prices for gasoline or diesel. Large fleets of heavy-duty vehicles -- from buses to garbage trucks to delivery vehicles -- have been among the earliest converts. One-quarter to a half of Navistar’s new vehicle sales in these markets opt for natural gas. Long-distance highway trucking may be the next to switch. Speaking with the Times, Navistar chief executive Dan Ustian, predicts that natural gas could capture up to a fifth of sales of highway tractor-trailers within a year. The need for on-road refueling infrastructure remains a constraint. There simply aren’t many publicly accessible natural gas refueling sites. The count is under 1,000, less than 1 percent the number of gas stations. Accidents & Negligence - Proponents have reported that groundwater contamination doesn't come directly from the "fracking" part of the process (the injection of hydraulic fracturing chemicals into Shale rock formations) but from other parts of the hydraulic fracturing process. Poorly constructed or damaged wellbores and pipelines can allow the fluid to flow into aquifers. 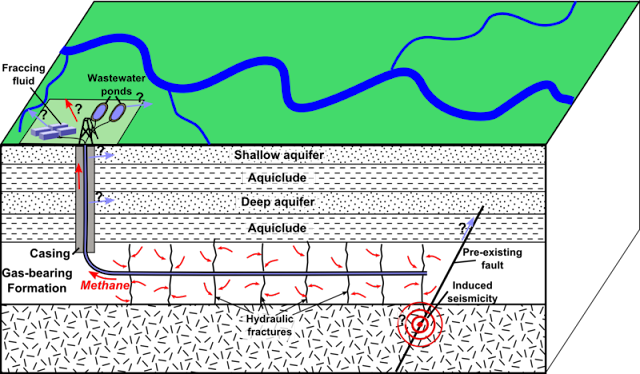 A 2011 MIT report found there is no evidence that these fractures can also penetrate shallow freshwater zones and contaminate them with fracturing ﬂuid, but there is evidence of natural gas migration into freshwater zones in some areas, most likely as a result of substandard well completion practices by a few operators. Volatile chemicals held in waste water evaporation ponds can to evaporate into the atmosphere, or overflow. In one of the cases described by a 2012 Cornell University study impounded wastewater was released into a field and pond, killing at least 70 animals. In another case, workers slit the lining of a wastewater impoundment (evaporation ponds) so that it would drain and be able to accept more waste. Groundwater may become contaminated by trucks carrying fracking chemicals and wastewater if they are involved in accidents on the way to fracking sites or disposal destinations. Release of unprocessed or under-processed waste water into rivers can contaminate water supplies. Surface Water Pollution - The flowback waste that is pumped out after a well is fracked is a salty brine, mildly radioactive, and laced not just with toxic chemicals but with natural hydrocarbons and heavy metals like barium and benzene, which are known carcinogens even in minute quantities. In fracking operations out West, the flowback is generally injected into underground sites that meet EPA standards. But in the Marcellus, there are virtually no injection sites. In the early days, gas producers did pretty much whatever they wanted with the billions of gallons of toxic water their operations produce. "Since there were no laws covering the disposal of this stuff at first, they just dumped it into rivers or hauled it off to sewage plants to be 'treated,' which they knew didn't work," says Deborah Goldberg, a lawyer at Earth­justice. "They just wanted to get rid of the stuff as quickly and as cheaply as possible." Methane Contamination of Drinking Water - In 2011, scientists at Duke University, published the first rigorous, peer-reviewed study of pollution at drilling and fracking operations. Examining 60 sites in New York and Pennsylvania, they found "systematic evidence for methane contamination" in household drinking water: Water wells half a mile from drilling operations were contaminated by methane at 17 times the rate of those farther from gas developments. Although methane in water has not been studied closely as a health hazard, it can seep into houses and build up to explosive levels. The study caused a big stir, in part because it was the first clear evidence that fracking was contaminating drinking water, contrary to the industry's denials. Just weeks after the study was released, the Pennsylvania Department of Environmental Protection fined Chesapeake $1.1 million – the largest fine against an oil and gas operator in the agency's his­tory – for contaminating 17 wells in Bradford County, including some that had been part of the Duke study. It is important to note that not every instance of groundwater methane contamination is a result of hydraulic fracturing. Often, local water wells drill through many shale and coal layers that can naturally seep methane into the producing groundwater. This methane is often biogenic (created by organic material decomposition) in origin as opposed to thermogenic (created through "thermal decomposition of buried organic material.") Thermogenic methane is the methane most often sought after by oil & gas companies deep in the earth, whereas biogenic methane is found in shallower formations (where water wells are typically drilled). Through isotope analysis and other detection methods, it is often fairly easy to determine whether the methane is biogenic or thermogenic, and thus determine from where it is produced. The presence of thermogenic methane does not confirm the source of gas. The gas composition and isotopic finger print must compared by experts with other known sources of gas to confirm a match. NORM - Naturally Occurring Radioactive Material- Radon gas in the natural gas streams concentrate as NORM in gas processing activities. Radon decays to Lead 210, then to Bismuth 210, Polonium 210 and stabilizes with Lead 206. Radon decay elements occur as a shiny film on the inner surface of inlet lines, treating units, pumps and valves associated with propylene, ethane and propane processing systems. NORM characteristics vary depending on the nature of the waste. NORM may be created in a crystalline form, which is brittle and thin, and can cause flaking to occur in turbulars. NORM formed in carbonate matrix can have a density of 3.5 grams/cubic centimeters and must be noted when packing for transportation. NORM scales may be white or a brown solid, or thick sludge to solid, dry flaky substances. Cutting and reaming oilfield pipe, removing solids from tanks and pits, and refurbishing gas processing equipment may expose employees to particles containing increased levels of alpha emitting radionuclides that could pose health risks if inhaled or ingested. The hazardous elements found in NORM are Radium 226, 228 and Radon 222 and also daughter products from these radionuclides. The elements are referred to as "bone seekers" which when inside the body migrate to the bone tissue and concentrate. This exposure can cause bone cancers and other bone abnormalities. The concentration of Radium and other daughter products build over time, with several years of excessive exposures. Radium radionuclides emit alpha and beta particles as well as gamma rays. The radiation emitted from a Radium 226 atom is 96% alpha particles and 4% gamma rays. The alpha particle is the most dangerous particle associated with NORM. Alpha particles are helium nuclei. Alpha particles travel short distances in air, of only 2-3 centimeters and cannot penetrate through a dead layer of skin on the human body. However, alpha particles are "bone seekers" due to Radium possessing a high affinity for Chloride ions. In the case that Radium atoms are not expelled from the body, they concentrate in areas where Chloride ions are prevalent, such as bone tissue. The half-life for Radium 226 is approximately 1620 years, and will remain in the body for the lifetime of the human; a significant length of time to cause damage. Fracking Additives are Secret - It is impossible to know what chemicals are flowing out of the wells, or how toxic they are, because companies are not required to disclose the compounds they use in fracking operations. Providers of fracking fluids, such as Halliburton, claim that the composition of such fluids can't be revealed without disclosing trade secrets. In 2005, the industry lobbied hard for what's known as "the Halliburton loophole," which exempts it from federal disclosure requirements. In recent months, Colorado, Texas and Pennsylvania have moved to tighten state regulations and require mandatory disclosure of what's in the fracking fluids, but loopholes still remain. "We don't know the chemicals that are involved," Vikas Kapil, chief medical officer at the National Center for Environmental Health, admitted at a recent conference. "We don't have a great handle on the toxicology of fracking chemicals." It is difficult to assess health impact because of the industry's strategic lobbying efforts that resulted in legislation allowing them to keep the proprietary chemicals in the fluid secret, protecting them from being held legally responsible for contamination. If you don't know what chemicals are, you can't conduct pre-drilling tests and establish a baseline to prove that chemicals found postdrilling are from hydraulic fracturing. Methane Leakage - Natural Gas is twice as clean as coal at the burner tip, but methane is 25 times as potent a greenhouse gas as carbon dioxide,” so gas might be dirtier than coal. Industry and environmental groups estimates of methane leakage diverge radically. An Greater focus needed on methane leakage from natural gas infrastructure finds that a shift to compressed natural gas vehicles from gasoline or diesel vehicles leads to greater radiative forcing of the climate for 80 or 280 yr, respectively, before beginning to produce benefits. Compressed natural gas vehicles could produce climate benefits on all time frames if the well-to-wheels CH4 leakage were capped at a level 45–70% below current estimates. By contrast, using natural gas instead of coal for electric power plants can reduce radiative forcing immediately, and reducing CH4 losses from the production and transportation of natural gas would produce even greater benefits. Estimates of the net climate implications of fuel-switching strategies should be based on complete fuel cycles (e.g., “well to-wheels”) and account for changes in emissions of relevant radiative forcing agents. Unfortunately, such analyses are weakened by the paucity of empirical data addressing CH4 emissions through the natural gas supply network. The U.S. Environmental Protection Agency (EPA) recently doubled its previous estimate of CH4leakage from natural gas systems. Contrary to previous estimates of CH4 losses from the “upstream” portions of the natural gas fuel cycle (8, 9), a recent paper by Howarth et al. calculated upstream leakage rates for shale gas to be so large as to imply higher lifecycle GHG emissions from natural gas than from coal (1). Howarth et al. estimated CH4 emissions as a percentage of CH4 produced over the lifecycle of a well to be 3.6–7.9% for shale gas and 1.7–6.0% for conventional gas. An analysis of reported routine emissions for over 250 well sites with no compressor engines in Barnett Shale gas well sites in Fort Worth, Texas, in 2010 revealed a highly skewed distribution of emissions, with 10% of well sites accounting for nearly 70% of emissions . Natural gas leak rates calculated based on operator-reported, daily gas production data at these well sites ranged from 0% to 5%, with six sites out of 203 showing leak rates of 2.6% or greater due to routine emissions alone. The EDF notes EPA’s reported uncertainty appears small considering that its current value is double the prior estimate, which was itself twice as high as the previously accepted amount. Each of the three curves within the panels of Fig. 1 represents a distinct choice and its associated emission duration: for example, whether to rent a CNG or a gasoline car for a day (Pulse TWP); whether to purchase and operate a CNG or gasoline car for a 15-yr service life (Service-Life TWP); and whether a nation should adopt a policy to convert the gasoline fleet of cars to CNG (Fleet Conversion TWP). In each of these cases, a TWP greater than 1 means that the cumulative radiative forcing from choosing natural gas today is higher than a current fuel option after t yr. The results for pulse TWP at 20 and 100 yr are identical to fuel-cycle analyses using 20-year or 100-year GWPs for CH4. Air Pollution - Natural gas is composed of methane, ethane, liquid condensate, and volatile organic compounds (VOCs). The VOCs that are especially impactful on health are benzene, toluene, ethyl benzene, and xylene (referred to as a group, called BTEX). Health effects of exposure to these chemicals include neurological problems, birth defects, and cancer. VOCs, including BTEX, mixed with nitrogen oxides from combustion and combined with sunlight can lead to ozone formation. Ozone has been shown to impact lung function, increase respiratory illness, and is particularly dangerous to lung development in children. In 2008, measured ambient concentrations in the rural Sublette County, Wyoming where ranching and natural gas are the main industries were frequently above the National Ambient Air Quality Standards (NAAQS) of 75ppb and have been recorded as high as 125 ppb. According to an article in 'Environmental Health Perspectives,' people living near shale gas drilling sites often "complain of headaches, diarrhea, nosebleeds, dizziness, blackouts, muscle spasms, and other problems." Cause-and-effect relationships have not been established. In Dish, Texas, a rural town northwest of Dallas, the state's environmental regulators detected levels of cancer-causing benzene, sometimes at levels dangerous to human health, likely coming from industry's 60 drilling wells, gas production pads and rigs, a treating facility and compressor station. At the same time, a state study in Pennsylvania of air quality near Marcellus Shale drilling sites in four counties found no emissions at levels that would threaten the health of nearby residents or workers. Induced Seismicity (Earthquakes) - A U.S. Geological Survey (USGS) team has found that a sharp jump in earthquakes in America’s heartland appears to be linked to oil and natural gas drilling operations..
As hydraulic fracturing has exploded onto the scene, it has increasingly been connected to earthquakes. Some quakes may be caused by the original fracking — that is, by injecting a fluid mixture into the earth to release natural gas (or oil). More appear to be caused by reinjecting the resulting brine deep underground. Earthquakes in Ohio weren’t caused by the original fracking — that is, by injecting a fluid mixture into the earth to release natural gas (or oil). It was caused by a Class II disposal well used to reinject the resulting brine deep underground. That reinjection is banned in some states. The Ohio Department of Natural Resources (ODNR) has issued a preliminary report “on the relationship between the Northstar 1 Class II disposal well and 12 Youngstown area earthquakes” (news release here). They spell out what happened and the steps they will take to make sure it doesn’t happen again. The analysis showed that shortly after hydraulic fracturing began small earthquakes started occurring, and more than 50 were identified, of which 43 were large enough to be located. Most of these earthquakes occurred within a 24 hour period after hydraulic fracturing operations had ceased. The earthquakes range in magnitude from 1.0 to 2.8. Compliance - An analysis of oil wells fracked and reported by industry since the beginning of the year shows dozens of those wells are not showing up on the State's website, as required by new state law SB 4. As many as 77 different oil wells that the gas and oil industry reported were fracked in January and February had yet to show up on the website run by California’s Division of Oil, Gas and Geothermal Resources (DOGGR) by May 20, 2014. Improve public information about shale gas operations: Create a portal for access to a wide range of public information on shale gas development, to include current data available from state and federal regulatory agencies. The portal should be open to the public for use to study and analyze shale gas operations and results. Improve communication among state and federal regulators: Provide continuing annual support to STRONGER (the State Review of Oil and Natural Gas Environmental Regulation) and to the Ground Water Protection Council for expansion of the Risk Based Data Management System and similar projects that can be extended to all phases of shale gas development. Improve air quality: Measures should be taken to reduce emissions of air pollutants, ozone precursors, and methane as quickly as practicable. The Subcommittee supports adoption of rigorous standards for new and existing sources of methane, air toxics, ozone precursors and other air pollutants from shale gas operations. (3) Encouraging shale-gas production companies and regulators to expandimmediately efforts to reduce air emissions using proven technologies and practices. (1) Measure and publicly report the composition of water stocks and flow throughout the fracturing and clean-up process. (2) Manifest all transfers of water among different locations. (3) Adopt best practices in well development and construction, especially casing, cementing, and pressure management. Pressure testing of cementedcasing and state-of-the-art cement bond logs should be used to confirm formation isolation. Microseismic surveys should be carried out to assure that hydraulic fracture growth is limited to the gas producing formations. Regulations and inspections are needed to confirm that operators have taken prompt action to repair defective cementing jobs. The regulation of shale gas development should include inspections at safety-critical stages of well construction and hydraulic fracturing. (4) Additional field studies on possible methane leakage from shale gas wells to water reservoirs. (5) Adopt requirements for background water quality measurements (e.g., existing methane levels in nearby water wells prior to drilling for gas) and report in advance of shale gas production activity. (6) Agencies should review field experience and modernize rules and enforcement practices to ensure protection of drinking and surface waters. Disclosure of fracturing fluid composition: The Subcommittee shares the prevailing view that the risk of fracturing fluid leakage into drinking water sources through fractures made in deep shale reservoirs is remote. Nevertheless the Subcommittee believes there is no economic or technical reason to prevent public disclosure of all chemicals in fracturing fluids, with an exception for genuinely proprietary information. While companies and regulators are moving in this direction, progress needs to be accelerated in light of public concern. Reduction in the use of diesel fuel: The Subcommittee believes there is no technical or economic reason to use diesel in shale gas production and recommends reducing the use of diesel engines for surface power in favor of natural gas engines or electricity where available. (1) Use of multi-well drilling pads to minimize transport traffic and need for new road construction. (2) Evaluation of water use at the scale of affected watersheds. (3) Formal notification by regulated entities of anticipated environmental and community impacts. (4) Preservation of unique and/or sensitive areas as off-limits to drilling and support infrastructure as determined through an appropriate science-based process. (5) Undertaking science-based characterization of important landscapes, habitats and corridors to inform planning, prevention, mitigation and reclamation of surface impacts. (6) Establishment of effective field monitoring and enforcement to inform ongoing assessment of cumulative community and land use impacts. Air: (a) Reduction of pollutants and methane emissions from all shale gas production/ delivery activity. (b) Establishment of an emission measurement and reporting system at various points in the production chain. Water: (a) Well completion – casing and cementing including use of cement bond and other completion logging tools. (b) Minimizing water use and limiting vertical fracture growth. Research and Development needs. The public should expect significant technical advances associated with shale gas production that will significantly improve the efficiency of shale gas production and that will reduce environmental impact. The move from single well to multiple-well pad drilling is one clear example. Given the economic incentive for technical advances, much of the R&D will be performed by the oil and gas industry. Nevertheless the federal government has a role especially in basic R&D, environment protection, and safety. The current level of federal support for unconventional gas R&D is small,and the Subcommittee recommends that the Administration and the Congress set an appropriate mission for R&D and level funding. Operators to plug back with cement, prior to injection, any well drilled in Precambrian basement rock for testing purposes. Top EPA officials said Wednesday that the new regulations would ensure pollution is controlled without slowing natural gas production. "By ensuring the capture of gases that were previously released to pollute our air and threaten our climate, these updated standards will protect our health, but also lead to more product for fuel suppliers to bring to market," said EPA Administrator Lisa Jackson in a statement. Much of the air pollution from fracked gas wells is vented when the well transitions from drilling to actual production, a three- to 10-day process which is referred to as "completion." An earlier version of the rule limiting air pollution from gas wells would have required companies to install pollution-reducing equipment immediately after the rule was finalized. Drillers now will be given more than two years to employ technology to reduce emissions of smog- and soot-forming pollutants during that stage. The EPA will require drillers to burn off gas in the meantime, an alternative that can release smog-forming nitrogen oxides, but will still slash overall emissions. Industry groups had pushed hard for the delay, saying the equipment to reduce pollution at the wellhead during completion was not readily available to service the about 25,000 wells a year are being fracked. Besides the new standards for oil and gas wells, the EPA also updated existing rules for natural gas processing plants, storage tanks and transmission lines that will reduce amounts of cancer-causing air pollution, such as benzene, and also reduce methane — the main ingredient in natural gas, but also one of the most potent global warming gases. There were other changes made since the EPA proposed the rule last July under a court order that stemmed from a lawsuit brought by environmental groups. Wells drilled in low-pressure areas, such as coalbed methane reserves, would be exempt because they release less pollution during completion. And companies that choose to re-fracture wells using the pollution-reducing equipment prior to the January 2015 deadline would not be covered by other parts of the regulation. The reaction from environmental groups was mixed on Wednesday, in large part to the two-year delay on requiring companies to perform so-called green completions. Chesapeake Energy - Oklahoma City, OK - The second-largest producer of natural gas, a Top 15 producer of oil and natural gas liquids and the most active driller of new wells in the U.S. The company's operations are focused on discovering and developing unconventional natural gas and oil fields onshore in the U.S. Chesapeake owns leading positions in the Barnett, Haynesville, Bossier, Marcellus and Pearsall natural gas shale plays and in the Granite Wash, Cleveland, Tonkawa, Mississippi Lime, Bone Spring, Avalon, Wolfcamp, Wolfberry, Eagle Ford, Niobrara, Three Forks/Bakken and Utica unconventional liquids plays. The company has also vertically integrated its operations and owns substantial midstream, compression, drilling, trucking, pressure pumping and other oilfield service assets. For more information on Chesapeake environment initiatives, visit the environment section of CHK.com, HydraulicFracturing.com, NaturalGasAirEmssions.com, NaturalGasWaterUsage.com, AskChesapeake.com or FracFocus.com. In April 2012 revelations that Aubrey McClendon, the company’s flamboyant co-founder, failed to disclose $1.1 billion of personal borrowing to co-invest in wells with the company have raised the specter of serious conflicts of interest and shaken investors. The company originally said its board was “fully” aware of the CEO’s financing transactions, but on April 26 said the directors were only “generally” aware and moved to end the co-investment program - which U.S. regulators are now scrutinizing. All the while, though, Chesapeake itself is becoming harder and harder to understand. The firm has been scrambling to raise about $10 billion in cash this year to help cope with a hefty debt load and sliding U.S. natural gas prices. Three transactions earlier this month raised $2.6 billion, but added to off-balance sheet debt and made the firm’s structure even more tangled. Chesapeake has negotiated seven joint ventures which give rival firms part-ownership of oil or gas fields in return for stumping up cash and a portion of drilling costs. No peer has a network of deals on anything close to this scale. Rival Devon Energy, which has a market value more than twice that of Chesapeake, has just one joint venture. And Chesapeake has concluded 10 volumetric production payment deals, under which it will hand over future output in return for cash paid upfront. The company has sold at least $4 billion-worth of its future gas production in this way, according to Argus Research. Investors wanting to wrap their heads around the firm must also contend with the fact it placed the cash flow from certain wells into a royalty trust - a type of vehicle in which the bulk of profit has to be distributed to its owners - and sold about half its interest for $440 million. The firm is also trying to sell a 20 percent stake through a public offering in its oilfield services firm, Chesapeake Oilfield Services, for $862.5 million. Visibility is further impeded by the firm’s over-active hedging business. Chesapeake reported realized gains on energy trading of $8.4 billion between 2006 and 2011. That’s more than four times its cumulative $1.8 billion of net income over the same period. “We don’t hedge just to say we’re hedged, we hedge to make money,” Chesapeake declared in a recent investor presentation. No gas rival trades energy on anything close to this scale, and it makes McClendon’s firm look at least as much like a hedge fund as a gas producer. Yet despite Chesapeake’s opacity and a 20 percent-plus fall in its market value since the end of March alone, investors still seem largely to give the company the benefit of the doubt. Its market capitalization is about $12 billion. That values the company at about 11 times estimated earnings for 2012 - in line with Devon Energy, but below the equivalent ratios for EOG Resources and Encana. But that isn’t, and shouldn’t be, the whole story. Chesapeake reported net debt of more than $10 billion at the end of its last quarter. That alone makes the firm’s debt load as a proportion of its market value almost twice as large as that of its major peers. But it also has plenty of what can be considered quasi-debt, including $4.3 billion of preferred stock and $1 billion of operating leases. Analysts think the firm should churn out about $4.3 billion of EBITDA this year. Include the quasi-debt and the market values the entire Chesapeake enterprise at just over six times EBITDA. Rivals like Devon, EOG and Encana are valued at roughly the same level. Yet Chesapeake deserves a discount for its complexity. EOG’s market capitalization is almost three times Chesapeake’s, but the smaller company’s 2011 annual report, as filed with the Securities and Exchange Commission, is more than three times as long. Add in other debt-like obligations, such as $14 billion in off-balance sheet commitments to partners in its various ventures, and investors’ apparent continuing faith in Chesapeake is even more of a head-scratcher. That’s even before considering the problem of Chesapeake’s cash flow - or lack of it. The firm has reported negative free cash flow every year for the past decade and doesn’t currently expect cash from operations to cover capital expenditures until 2014. Chesapeake can go on selling chunks of its businesses but that tends to mean the best bits get sold first. If the company insists on partial sales, that will add further complexity. And as the web of partnerships becomes denser, the company will get harder to sell as a whole. With no cash flow and its byzantine structure, Chesapeake is a trust-me story. The CEO’s personal transactions raise questions about the basis for such faith. All the more reason for investors to steer clear unless and until McClendon and his colleagues can explain exactly what’s in the corporate black box they have constructed. Marcellus Shale Coalition (MSC), formerly known as the Marcellus Shale Committee, is made up of over forty natural gas exploration and production companies with an interest in Marcellus shale development in Pennsylvania. It has even a larger number of assoicate and non-profit members. MSC is jointly sponsored by the Pennsylvania Oil and Gas Association and the Independent Oil and Gas Association of Pennsylvania. STRONGER - State Review of Oil and Natural Gas Environmental Regulations - Oklahoma City, OK - Formed in 1999 to reinvigorate and carry forward the state review process begun cooperatively in 1988 by the U.S. Environmental Protection Agency (EPA) and the Interstate Oil and Gas Compact Commission (IOGCC). Drilling Like There's No Tomorrow:Bankruptcy, Insurance, and Environmental Risk Judson Boomhower Energy Institute at Haas School of Business November 2014 A a new Energy Institute at Haas working paper (available here), shows how making producers more accountable for environmental damages can help policymakers encourage the continued development of these valuable resources while ensuring environmentally safe drilling and production. As the paper explains, there is a moral hazard problem that can lead oil and gas producers to take too many risks. Bankruptcy protection insulates small companies from worst-case outcomes by limiting their liability to their current assets. In addition, some types of environmental damage, like groundwater contamination, may take years to be detected. At that point, small producers may no longer exist or have the resources to finance cleanups or compensation. The solution found in Texas was to require producers to buy a surety bond to cover the risk of environmental damage. The Downside of a Boom By DEBORAH SONTAG and ROBERT GEBELOFF New York Times, Nov. 22, 2014 -- North Dakota, a small state that believes in small government, took on the oversight of a multibillion-dollar fracking industry with a slender regulatory system built on neighborly trust, verbal warnings and second chances. Modern Drilling Operations: Hydraulic Fracturing - Views of Devon drilling activities in a suburban area in Texas' Barnett shale. The Truth About Gasland - The Film "Gasland," whatever the intentions of the filmmaker, has contributed to a dialogue based more on fear than facts. While it is a dramatic movie, 'Gasland' is a deeply flawed documentary that gets several important facts wrong. Barnett Shale: An Aerial View - Video showing the transformation of Texas landscape by shale drilling. Barnett shale land farms is a video discussing the dumping of drilling waste on land farms in Texas. Rural Impact is a documentary that focuses on environmental impacts of gas drilling in Colorado. SkyTruth: Upper Green River Valley - A View From Above - 3-D visualization of natural gas development in Wyoming.